The button staff can use at a hospital in Lincolnton to reach the virtual command center. Some hospital systems are using a sort of virtual command center to monitor their sickest patients from dozens or even hundreds of miles away. Virtual intensive care units, also called eICUs, are a way to bring the expertise of a major medical center to remote hospitals in rural areas. In the intensive care unit at a small hospital in Lincolnton, Richard Gilbert thought he had two TVs in his room. 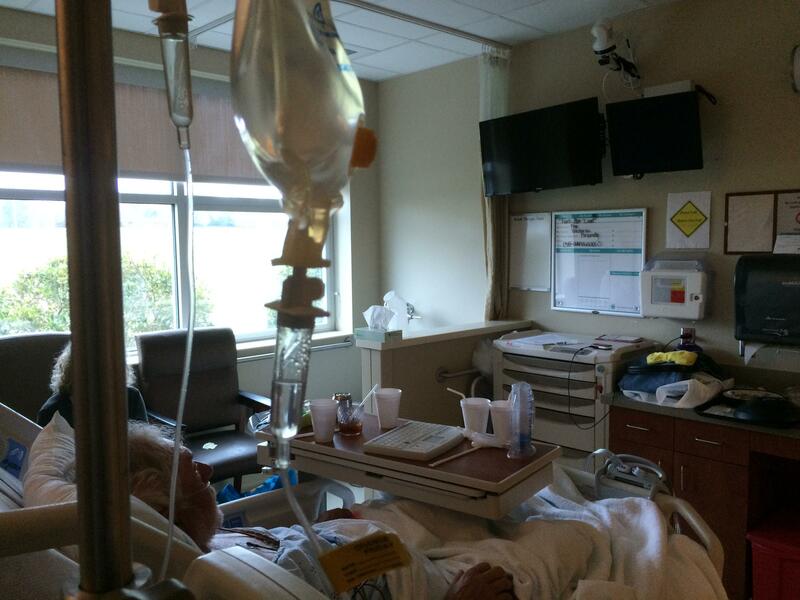 The screens both look down at his hospital bed. "I was sitting here watching television and then all of a sudden the other one comes on, and I thought, well, how’d I turn that on?" he said with a laugh. Richard Gilbert looks up at a TV screen and an eICU screen in his hospital room. On the second screen was a nurse wearing a headset. Gilbert said she started asking him questions, and they spoke for about 15 minutes. He's a farmer who’s recovering from pneumonia. After being here two days, he's now used to the camera turning on. A doorbell goes off first to announce the nurse is looking in. "Hey!" Gilbert said excitedly as it went off. "How are you feeling, sir?" nurse Cassie Gregor asked him through the screen. Gregor is specially trained in critical care. She doesn’t replace anyone - she’s an extra layer of support for the nurses and doctors at the bedside, including Dr. Jessica Fox. "This was huge for this hospital," Dr. Fox said. Dr. Fox was here before Carolinas HealthCare System set up the virtual ICU about two years ago. She said it’s helped her staff handle more complex patients. "The big thing for us is keeping patients close to home and being able to care for them with the appropriate means, and this allows us to do just that," she said. The virtual command center is located 45 miles away in Mint Hill. Carolinas HealthCare uses it to monitor ICUs in 10 hospitals. Compared to how those units normally sound, the command center is oddly quiet. Dr. Scott Lindblom said that’s intentional. "There's not any bells or whistles, nothing going off," he said. "I mean, makes it a much more pleasant environment actually to work in than what we're used to, the usual chaos of the ICU." The virtual command center in Mint Hill. 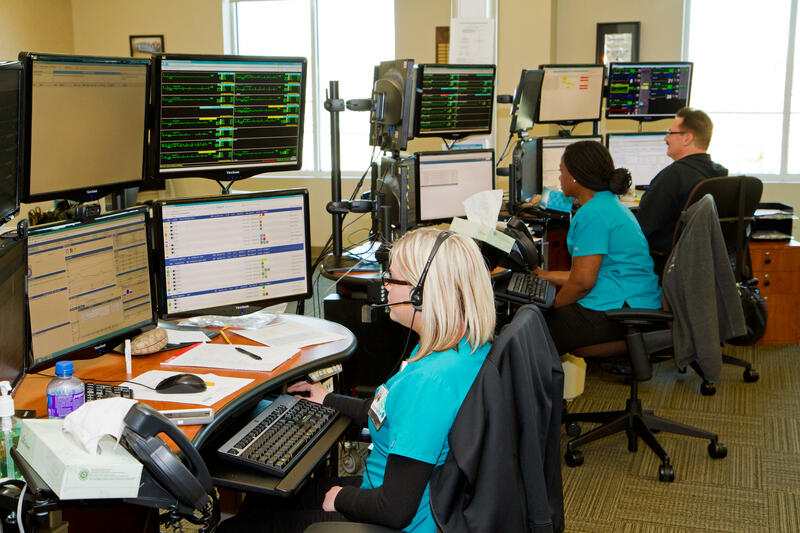 In the command center, there are usually seven to nine critical care specialists. Nurses are here 24-7, doctors work nights, and everyone still spends time at the actual hospitals, too. Sitting in front of six computer screens. Nurse Qiana Gadson said she loves this. "There are things that I'm able to view here, trends that I'm able to view here, that I'm not able to view at the bedside that sometimes I wish was available to me," she said. Virtual operations director Kimberly Purtill agrees it’s much easier to monitor trends here and said that’s part of the reason this is effective. "We might see a trend up with their white blood cells, a trend up with their temperature, and their blood pressure going down," Purtill said, all of which would be warning signs of an infection. "If you were off yesterday as a bedside nurse and you're on today, you don't have the picture from yesterday," she continued. "But we have it in front of us on our screen," and it’s easy to give the bedside staff a heads up. "We're taking care of more patients than we were two years ago, and across the system, our mortality rate is dropping," he said. "And across the system, our length of stay is dropping. It's almost the perfect storm of good care." Among the 10 hospitals in the program, ICU mortality is down 5 percent and length of stay is down 6 percent. Dr. Lindblom said virtual care doesn’t get all the credit, but it’s a big part. Leah Binder is president of The Leapfrog Group, a national advocate for better hospital care. She said the gold standard is to have critical care doctors on site, not on camera. "However, that's not always possible for every hospital and particularly in rural areas, so second to that is a virtual environment," she said. Binder said as the technology leads to better care, it could also lead to lower costs. In the Midwest, Avera Health estimates its virtual ICU has resulted in $70 million worth of savings over the past 10 years. Head of eCare Deanna Larson said from one hub in South Dakota, Avera monitors patients as far away as Minnesota and Wyoming. "I think we quit calculating miles a while back," she said with a laugh. "It's a very vast area of land." Larson said before virtual care, complex patients were often transferred to major medical centers. Now some of those patients can stay closer to home, and that means more business for their local hospital. "Keeping 10, 12 patients more maybe means another nursing job that stays local, maybe another lab tech job," she said. "What the technology is really doing is keeping those economics closer to home and helping them maintain viability." It’s simple: hospitals don’t get paid for patients they don’t treat. Back in Lincolnton, Dr. Jessica Fox said her ICU has been much busier. "The unit went from basically having a couple patients and closing all the time because we were having to transfer so many patients, to now being almost full all the time because we're able to keep patients here," she said. In an ICU bed, lifelong farmer Richard Gilbert said the more people looking after him, the better. "That's sort of like me and farming - if I've got a five-man job and I go out there with two people, you might miss something," he said. "But if you got your whole crew, you don't miss anything. You get it done." Starting this week, patients in critical condition at three Charlotte hospitals will have an extra set of eyes watching over them. That's because Carolinas HealthCare System is rolling out a sort of virtual command center in Mint Hill. From there, intensive care specialists will monitor patients.